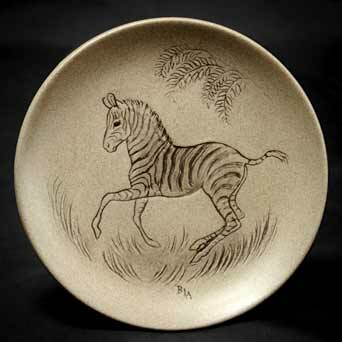 Poole zebra plate - 5⅛" (130 mm) diameter. Poole, in Dorset, due to the abundance locally of good red clay, had long been a centre for the making of pottery when Jesse Carter bought James Walker's tile manufacturing company in 1873. In 1895, Carter & Co. took over the Architectural Pottery Company in Hamworthy. The wares produced then were mainly floor and wall tiles, architectural decorations, shop fascias. Owen Carter, Jesse's son, developed the production of art pottery with different glazes, and by the time of the first World War, the company was making a wide range of decorative wares. Expansion followed and after Owen's death in 1919, his brother Charles found it difficult to meet the ever increasing demand for the company's products. He discussed the matter with his friend, Harold Stabler, and Stabler persuaded the Stoke potter John Adams to move down to Poole. The partnership of Carter, Stabler and Adams was born in 1921. It could be said that the thirties were Poole's heyday. Some of the most memorable designs come from that time. Truda Carter, Charles's wife, and John Adams produced a succession of outstanding patterns that have become classics. The forties were something of a black hole. Wartime restrictions curtailed production severely, and by the start of the following decade most of the original design team had retired or died. A new managing director, Lucien Myers, took the Poole Pottery into the fifties, and again the company was in the forefront with their new 'contemporary' designs that really characterized the Britain of the fifties. The designs of the sixties and seventies were a complete departure from anything that had gone before. The paintresses were allowed a free hand, and their abstract patterns were, as in previous eras, exactly right for the time. These patterns defined the look of the sixties and were enormously popular. As with most extreme fashions, they were to become passé, and the bright orange, yellow and brown pieces were often hidden or discarded in the following decades. A revival of interest in the nineties, though, has seen the prices paid for these item rocket. Looking at the designs from a viewpoint where they are neither fashionable nor unfashionable, they are outstandingly good. Poole Pottery continues to flourish and to produce wares that are right for the time. There is a thriving collectors' club, and interest does not flag.